M.2 SSDs, as we all know, are small in size and that is why they are usually used as internal storage for SFF desktop builds and especially in thin laptops like ultrabooks. While it is suggestible to use M.2 SSDs in these kinds of applications, one should not limit it to that, because there is another application that will surely be of benefit to those who are always on the go and are in need of a portable storage that can keep up with their fast-paced lifestyle. 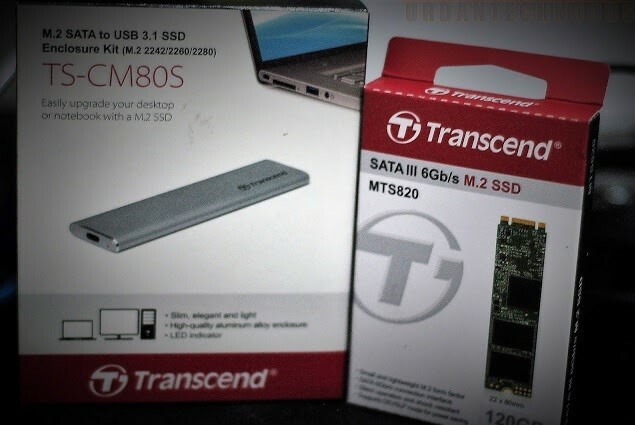 This is what I’ll check out with the help of Transcend’s MTS820 and TS-CM80S. First, let’s check out what’s up with the two before we take them out for a spin in our test scenarios. The MTS820 and TS-CM80S exude a familiar Transcend packaging vibe. Both of the boxes are donning Transcend’s red and white color scheme, with the products’ glam shots and unique features at the front. At the back are the products’ specifications that one needs to know about. Also seen at the back are the package contents for the TS-CM80S, while installation procedure is what you’ll find at the back of MTS820’s box. The inclusions of TS-CM80S in the package are: M.2 adapter (inside the enclosure), M.2 enclosure, Type-C to Type-A USB Cable (45cm), mounting screws, screwdriver, copper nut, metal plate and aluminum sticker. Everything that you’ll need to turn MTS820 M.2 SATA SSD into a portable is included, so installation should be pretty straightforward from this point on. Moving on to design, the MTS820 is a ready-to-use, no frills bare M.2 SSD. By utilizing SATA III 6GB/s interface and its built-in SLC caching technology, the Transcend MTS820 is able to achieve of transfer speed of up to 550MB/s read and 420MB/s write. The TS-CM80S is entirely made of aluminum with the Transcend name and logo elegantly printed at the lower part. To accommodate devices with different USB ports, the TS-CM80S M.2 SSD enclosure is engineered to convert to a USB Type-C port, offering flexibility of being used on different platforms with either USB Type-A or Type-C port. The M.2 SSD enclosure uses the USB 3.1 Gen 1 interface incorporated with UASP (USB Attached SCSI Protocol) that makes transfer speeds faster than with a sole USB 3.0 interface when used with a UASP-enabled host computer. As we’ve mentioned a while back, installation would be easy as all the necessary tools are included in the package of the M.2 Enclosure Kit. You’ll just need an M.2 SSD to go with the Enclosure Kit. It doesn’t matter if it’s 2280, 2260 or 2242, because the Transcend TS-CM80S is compatible with most M.2 SSD form factors. To install the M.2 SSD, first, take the M.2 adapter from the enclosure and insert the M.2 SSD in its proper slot. Then, attach the copper nut on the M.2 SSD’s far end and screw it down tight. 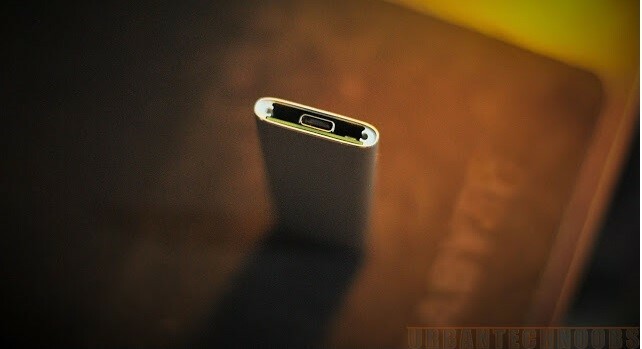 Slide the finished M.2 adapter into the enclosure and seal it with the metal plate, two screws and aluminum sticker. Take note that the led indicator is located at the bottom right, so the metal plate and aluminum sticker’s tiny holes should be aligned with it. To test out the performance of our finished M.2 external drive, we’ll run a couple of synthetic benchmarks just to set our expectations. Below are the results of our synthetic benchmarks. We ran each benchmark software a couple of times with just seconds of interval from each of the run. The last run is what we extract as a result, because the last run is when the device is stressed. Clearly, the scores that it got are almost similar. We measured 515MB/sec read and 412MB/sec write speeds in AS SSD, 563MB/sec read and 484MB/sec write speeds in CrystalDiskMark. With that, the TS-CM80S and MTS820 have proven that they work well together and that great things come in small package. 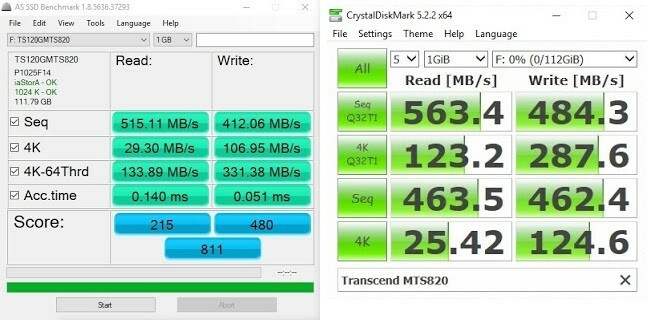 If you have an M.2 SSD lying around and you want to take advantage of its fast transfer speeds and form factor, you need not look any further, because Transcend’s TS-CM80S is the one you need to breathe new life into your pale looking M.2 SSD.